Dr. Tom Greidanus is a board certified Emergency Physician with extensive management experience in the military and private sector. He has a Masters in Health Care Management and is recognized by Beta Gamma Sigma for academic excellence in business school. Currently a staff physician at Parkview Medical Center (Pueblo, CO), he has served as the Chair and the medical director of the emergency department. Dr. Greidanus is currently the Chief of Staff at Parkview Medical Center. His leadership experience has led Tom to seek out innovative ways to improve patient care. Dr. Greidanus is a co-founder and Chief Medical Officer for Incendant, a patient engagement company. 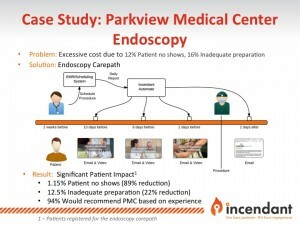 Incendant believes that improved patient engagement leads to happier and healthier patients, at a lower health care cost. The following slide illustrates the results of the implementation of Incendant’s patient engagement strategies for the Endoscopy service line at Parkview Medical Center, demonstrating an 89% reduction in no-shows in just one month.